A new Lynyrd Skynyrd documentary, “If I Leave Here Tomorrow”, will premiere on Showtime next month. Named after a lyric in the group’s iconic 1973 song “Free Bird” and directed by Stephen Kijak, the project features rare interviews and never-before-seen archival footage while taking viewers on a trip through the history, myth and legend of one of the most iconic American rock bands. Rising from the swamps of the deep south, the Jacksonville, FL outfit came to define an era with their hard-rocking boogie-woogie sound, soulful lyrics, and drunken and dangerous antics. 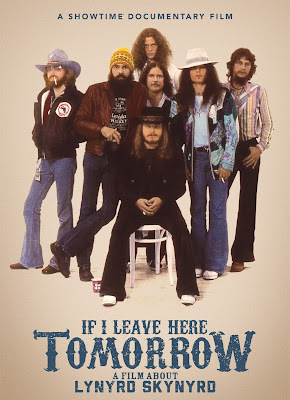 “If I Leave Here Tomorrow” is primarily narrated by guitarist Gary Rossington, the last of the Street Survivors and founding member along with Van Zant and Allen “Freebird” Collins. As the only original member still in the band today, Rossington’s recollections, from the beginning to the very end, mingle with the tales of drummer Artimus Pyle and “Sweet Home Alabama” co-writer Ed King, interviews with the late drummer Bob Burns, “Honkette” JoJo Billingsley, producer Al Kooper, and recently discovered radio interviews with the late founding members, Leon “Mad Hatter” Wilkeson, Collins and Van Zant. “Lynyrd Skynyrd: If I Leave Here Tomorrow” will premiere on Showtime on Saturday, August 18 at 9 p.m. ET/PT on Showtime on-air, on demand and over the internet. Lynyrd Skynyrd are currently playing shows on The Last Of The Street Survivors Farewell Tour, which was recently extended to the end of the year with the addition of a new leg of US dates this fall. With sales of more than 30 million albums worldwide, Lynyrd Skynyrd were inducted into the Rock And Roll Hall Of Fame in 2006.